Read about it on my tumblr! 1: Did you hear about the order? 1: They've come from a Doctor Johnathan Crane. 2: Never heard of him. 1: Well, in Gotham, U.S.A, he's called "Scarecrow". The thoughts inside the Pigmask's head: Ƨσ...ʏσʋ'ʌɛ ғιɢʋяɛ∂ ωнσ Ɩ αм...Ɩ'м яαтнɛя ιмρяɛƨƨɛ∂, ʏσʋ ƨнσʋℓ∂ вɛ тнαиκғʋℓ...тιмɛ тσ ғαcɛ αℓℓ ʏσʋя ғɛαяƨ! Oh my gosh i really love your art of the trio. Your art style is way better than mine! Oh my gosh, I haven't seen you in years. 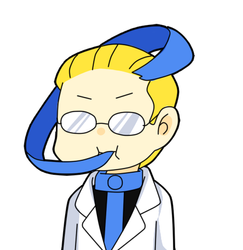 I used to stalk you when you did Hetalia/Earthbound. Your style evolved! And it looks great!